Around the time I started getting really into quilting, the Ann Kelle Remix prints were released. I bought a lot of them. I was so excited by the bright and fun and exciting prints. So when I had the opportunity to make a couple of projects with new Ann Kelle prints for Robert Kaufman I jumped at the chance. The first project was for the new collection Wonder. I seriously thought my daughter was going to hide these fabrics and never give them back because they have two of her favorite things: rainbows and unicorns. I made an apron with each colorway, one that is pleated and a peplum apron. The second project is a quilt using the Girlfriends line. Two new amazingly adorable fairy prints have been added to the collection. 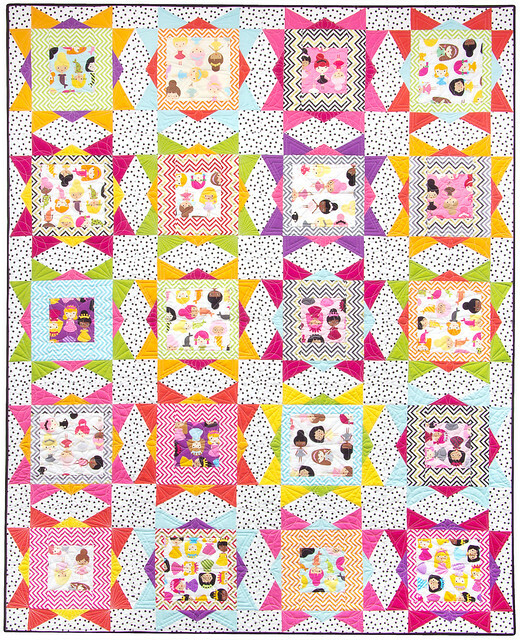 This quilt uses a combination of Girlfriends, Remix, and Kona Solids and it was quilted by the brilliant Angela Walters. Tutorials for these projects will be available on the Robert Kaufman website by March. Oh, I like that pattern so much! Sweet aprons and that's a great quilt pattern! 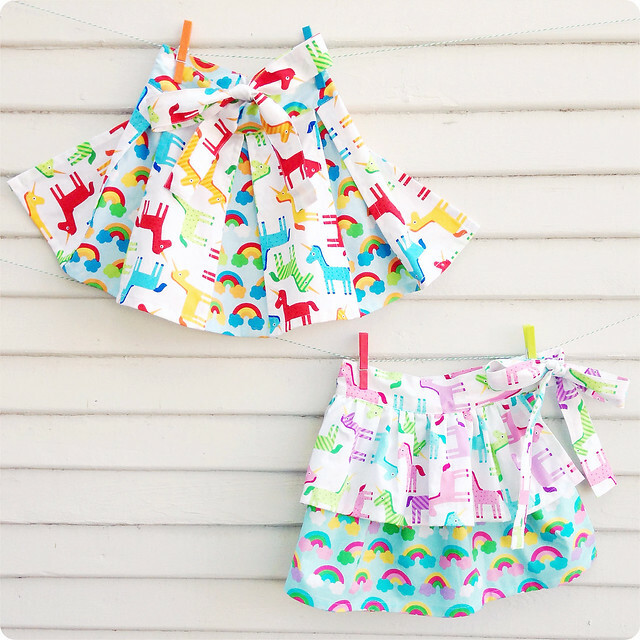 Her prints are fabulous, love those cute rainbows! Oh I bet she just loves wearing those aprons all of the time! The quilt pattern is really cute--perfect for big fancy fabrics! Love that Girlfriends quilt - can't wait ti read more about it!! I love that quilt! It is so bright and happy! the skirts are so cute and I love the simple pattern in the quilt, perfct to show of the fabric! I love Ann Kelle's fabric! Your aprons are beautiful, can't wait to see them published.